Weston gave presentations about the making of Hugo Award rockets and made the presentation available to The Hugo Awards web site for us to preserve here. 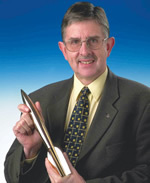 The World Science Fiction Society recognized Weston’s contributions to the Hugo Award by including his name in the WSFS Constitution after the original designers of the Hugo Award trophy, Jack McKnight and Ben Jason. Besides his contributions to the Hugo Awards, Weston chaired the 1979 Worldcon in Brighton, UK, and was Fan Guest of Honor at the 2004 Worldcon. He edited anthologies and was a finalist for the 2005 Hugo Award for Best Related Work for his memoir, Stars in My Eyes: My Adventures in British Fandom.